voted the most popular rose in the world at the 11th World Convention of Rose Societies, 1997 Silvery, blush-pink, medium sized, double flowers Hardy in zones 4-9 Loves the sun. Height: 12-18' Width: 6-10' The starter rose you will receive is growing in a 4" pot. Ships dormant during the winter and early spring months. The yardstick against which all repeat flowering climbers are judged. 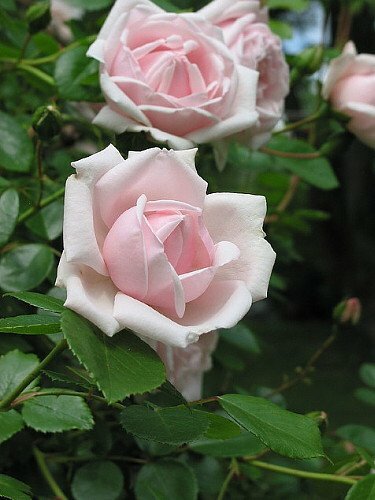 In 1997 'New Dawn' was voted the most popular rose in the world at the 11th World Convention of Rose Societies. Silvery, blush-pink, medium sized, double flowers with nice form produced in profusion on a great plant. May be grown as a shrub. Winter hardy to zone 4. Outstanding. Repeat Bloom.